C stands for cancer and that's a catastrophe which also starts with C. But C can stand for comedy and maybe laughing is a better way of dealing with a problem than sobbing uncontrollably. We're all going to go sooner or later. You know it; I know it. However the trick in not knowing it is that we're not forced to face our limited time of Earth. Will Reiser, the film's screen writer, has loosely based the story on his life and his own battle with cancer. He was diagnosed with a rare form of cancer that developed as a tumour on his lower spine with the mouthful of a name neurofibroma-sarcoma-schwannoma. While the actor Joseph Gordon-Levitt plays the part of Adam (Reiser) in the film, his buddy in the film, Seth Rogen, was and is the real-life friend of Reiser. In interviews Rogen talks about the gravity of the situation when Reiser first found out about his cancer and how humour was part of dealing with the news. Roger Ebert mentions that Reiser is now in his sixth year of remission and quoted Reiser as saying, "Remission apparently lasts forever … or until you die." While that statement is amusing, I must add the dark take on the humour in that anybody who has had cancer once, always expects it to come back eventually. To add some context to Mr. Reiser, with a nod to six degrees of separation, he is the brother of the comedian slash actress Robin Reiser and the cousin of Paul Reiser, stand-up comedian, etc. (Mad About You: 1992-1999). He has been working as a writer and producer for more than a decade and in going down his list of various accomplishments, I see that he at one time wrote for the Ali G show. The film covers Adam's discovery of the cancer, his attempts to deal with it and the help he gets from his girlfriend, his buddy (Seth Rogen), his mother and father and a therapist at the hospital. The therapist is pretty young, pretty and turns out to be potentially more than a therapist. Adam's cancer support group is amusing and shows how health problems can cut across all barriers whether it is age or class. The sudden disappearance of one member of the group is a poignant reminder that death is unexpected, even if it is expected. Cancer is a scary thought but then again, our own mortality is something which haunts all of us in one way or another even if it's not something we obsess about on a daily basis. It is, nevertheless, always in the back of our minds. I found that Will Reiser has written an interesting, funny and charming story about a subject which has great potential for tragedy. I enjoyed the film and would recommend seeing it. As the therapist says, "You can't change your situation. The only thing you can change is how you choose to deal with it." Let's choose to have a good laugh. A good-hearted film about a difficult topic, 50/50 maneuvers between jokes and drama with surprising finesse. 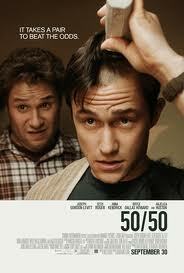 50/50 is a 2011 dramedy film directed by Jonathan Levine, written by Will Reiser, and starring Joseph Gordon-Levitt and Seth Rogen. The film is loosely based on the life of screenwriter Will Reiser.